The latest version (18.9.60) is greatly improving custom reports functionality. Or you can generate custom report which shows your general ledger transactions grouped by account for specific period. Or you can take it even further and show general ledger transactions only for Accounts receivables account group them by customer name. 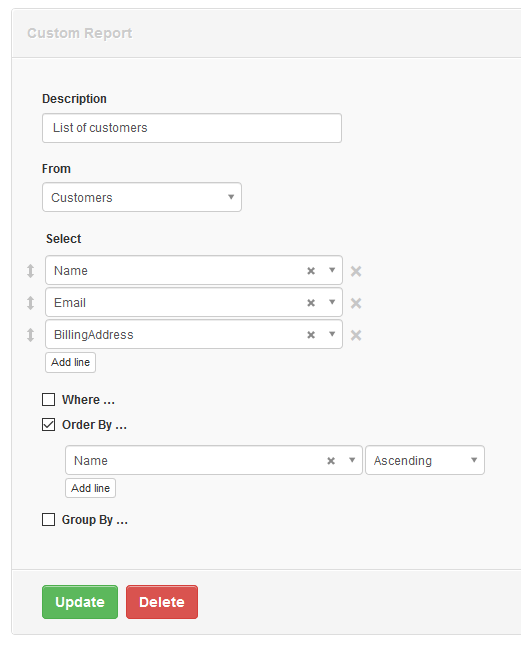 Done Add ability to query individual lines such as sales invoice lines, purchase invoice lines etc. To prioritize what’s important, I’d like to hear from you to see what reports you hope to generate in Manager right now. This will give me valuable feedback to see what features need to be added to custom reports first. Great news! Thanks for making this happen. I described what is mandatory for Macedonia here, I hope we are getting closer to that. This is really Great news! Thanks a lot, @lubos. Please try to add the custom fields also in selection drop-down menu. I have started looking through the different information in each table (bank Accounts, etc) but wuld it be possible to add all of the fileds at one go eg using * or a box to include all fields. It isn’t clear what each field holds especially for GL transactions. Why do Bank Receipts not have a field to distinguish receipts from payments? This two… more exposing custom fields. Also adding the possibility to export the report in excel. Great news. Thanks and it would be great if you could squeeze in the other things in the upcoming days. Today I played a little bit with the new functionality and I created a general ledger transaction report. There is something funny with the layout. Some amounts show up as e.g. 135.00 and others as 60.0. Well done, this is a major leap forward. Thank you! Sir, You are always helpful. It is a great feature for us in manager. Thank you so much. @lubos, thanks for the great feature. Think about ability of the operator “or” in “Where” part of the SQL Query, as well as using more than one table in “From” part. I thing that the “join” part, in @lubos idea, is completely carried out via general ledger transaction query which join every table of the software. Is my interpretation correct? 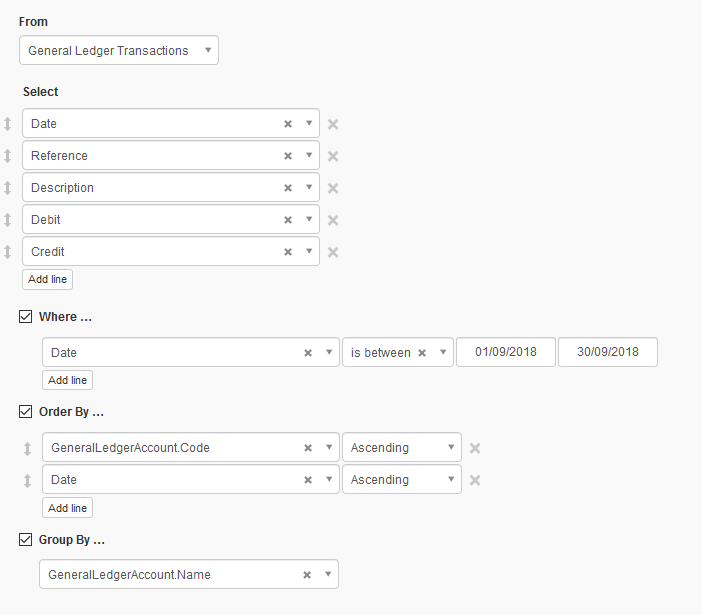 @pandhm @Davide, joins in custom reports are automatic but General Ledger Transactions fields are not yet 100% populated. Currently, Customer field is filled only for general ledger transactions posting to Accounts Receivable. Similarly, InventoryItem field is only filled for general ledger transactions posting to Inventory on hand account. That’s why getting general ledger transactions for Inventory - sales shows empty customer and empty inventory item. I’m working on fixing this issue. 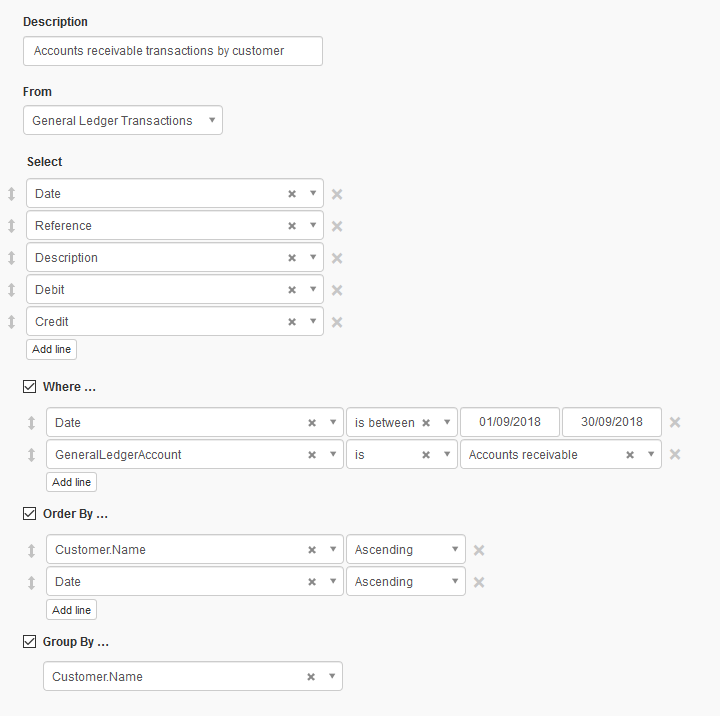 Your custom report setup is correct, it’s just that General Ledger Transactions report doesn’t populate those fields yet. This will be fixed. Business Name on report should be fixed. If business name was provided under business details, then I agree Manager should use that on reports just like it is using it on all other documents. The latest version (18.5.82) is making it that way.